Some of our most familiar and desirable of reptile pets, such as the leopard gecko and the brilliantly-colored day geckos, are members of a fascinating family of lizards that I would like to introduce today. The 1,050 or more species of geckos comprise the second largest of lizard families, the Gekkonidae (the largest is the Scincidae, or skinks). They range throughout the world, reaching their greatest diversity in desert and tropical habitats. “House geckos” of several species follow human habitation and are widely transplanted, including into the southeastern USA. Geckos range in size from the various Shaerodactylus species, some of which are full grown at 1.2 inches in length, to the New Caledonian giant gecko, Rhacodactylus leachianus, a bulky creature that tops out at nearly 15 inches. Several other species, now considered extinct but which may possibly still survive in Madagascar’s forest canopy, reached 24 inches in length. Geckos generally lay 2 eggs, although some bear live young. Arboreal types often glue their eggs to tree branches or building walls. Most are insectivorous, but many take nectar and over-ripe fruits as well. The voracious tokay gecko, Gekko gecko, consumes nestling birds, small rodents and bats, snakes and other lizards. 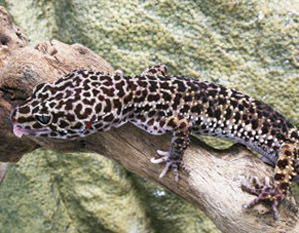 A number of species are highly endangered while others, such as the leopard gecko, Eublepharis macularius, are pet trade staples. Many have a long association with people, being welcome in homes for their insect-catching abilities and sometimes regarded as good luck symbols. Some years back, a store in NYC even rented tokay geckos for use as roach-control agents. However, the males’ habit of calling loudly (“Tokay-Tokay!”) at 4 AM and their pugnacious dispositions rendered the scheme less-than-profitable! The ability of many geckos to climb sheer walls (even glass) and to run upside-down on ceilings was first recorded by Aristotle in the 4th century BC. Only recently has the secret behind this remarkable phenomenon been discovered. The toes of many species are covered with layered pads known as lamellae, which in turn support thousands of microscopic hair-like structures called setae. Their action against a surface sets up a weak molecular attraction known as the van-der-Waals force, and this, it seems, is the source of their unique method of adhesion. This phenomenon is being studied with a view towards creating new adhesives for use in industry. Members of this huge family have evolved startling adaptations to a number of basic themes. To cite just one example – depending upon the species, tails are used to distract predators (by disengaging from the body), plug burrows, extrude noxious secretions, create sound, communicate with others, convey stability while gliding, store food and grip branches.